Retain your independence for years to come with a program tailored to your needs as your health care changes—right in your own home. 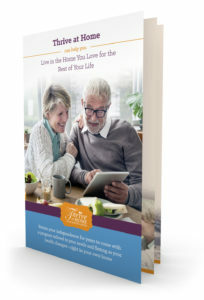 Thrive at Home with Whitney Center is a new Life Care at Home health and wellness membership program, designed to help you stay healthy and independent in your home—an ideal way to secure long-term peace of mind. With Thrive at Home, there’s no need to move and no need to worry. You stay in the comfort of your own home near your family and friends, continuing to enjoy your lifestyle as you know it. Fill Out the Form & Download Our Free Brochure!